There are many critical steps to preparing for an audition with a Drum Corps. It is entirely different than auditioning for a High School Marching Band. Most High School Bands will accept new members at any ability or experience level. 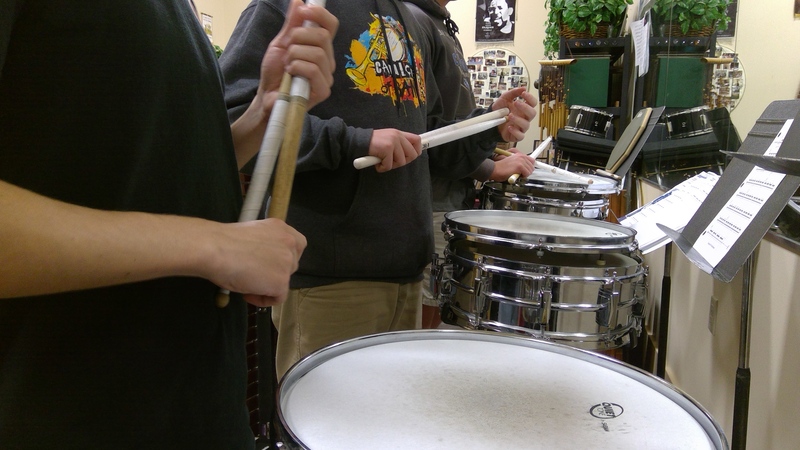 The audition is typically an assessment of a student’s percussion skills. It gives the director or percussion instructor an opportunity to place students on instruments that fit their ability and the percussion section positions that are available. Once a student is a member, it is not likely they will be removed from the program. Drum Corps have an entirely different philosophy. From the minute you contact them through your eventual membership you are trying out. In their world, they assume you would be trying out because you have your basic chops built, can read almost anything, and are used to being in a group. The goal in their mind is “can you fit” or “can you clean” which really means are you able to synchronize your sound perfectly with other players. All this would be while you are moving around on a football field or in a gym. It is quite a workout, mentally and physically.How do you get eliminated from a drum corps is by not having the discipline to keep up and keep matching your sound. You must continually practice to keep developing. You must keep learning your music and changing it continually as they do to keep matching. Marching Band music usually does not change in a season. Once you are given a part to learn you stay they for the season. There are contests in the Fall and several weekends. It is a great experience one remembers their whole life. You make lots of friends and have fun. Drum Corps music changes every day. Every time you play your part you are trying to keep it. If you slack off and can’t match others you will be moved and even sent home. The judges make recommendations each contest, the instructors adapt to those recommendations and the music is rewritten. Sometimes entire songs are discarded and replaced. Each night is usually a contest throughout the summer. No matter what the change, the performers learn it quickly, memorize it, adapt the drill pattern, and match the other players. It’s the name of the game. It is an experience where one participates to create a perfect music product which takes ultimate focus and discipline. It is one of the most disciplined activities in music. It changes ones life. You remember your fellow musicians for your life. First – Know your basics as well as “breathing” so when you play you can match the sound of all the other players. Be able to march to anything you play. Second – Have refined sight reading skill. Drum Corps change their music daily to improve the scores at each contest. Third – Learn the Drum Corps warm up patterns. You need to learn and memorize them to play a great audition so the instructors with see you can be an asset to the group. Fourth – Know how to “clean” or match other players exactly. Players must be flexible and continually improve. If you don’t you will be eliminated from the group. Learn to become a member of a top Drum Corps International (DCI) Rated organization. I did and it positively changed my life in many ways.